Recently, I was invited by Creative Scrapbooker Magazine to participate in the Multicraft Challenge. If you aren't familiar with Multicraft, they are a Canadian based craft supply company that has affordable, good quality craft products. In fact, I recently saw some of their products in my local Walmart as well. 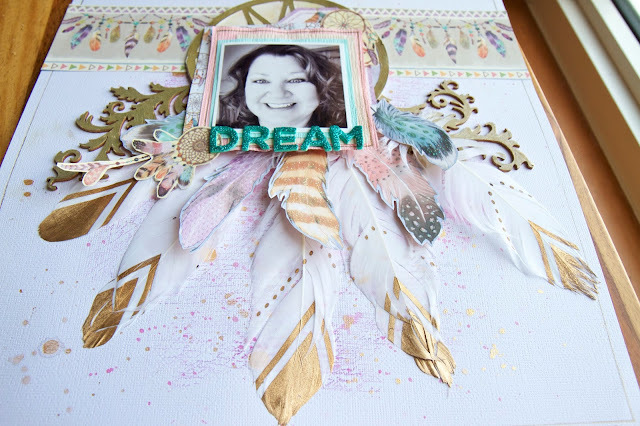 Three scrapbookers were invited to take part in the challenge and given exactly the same products to create a layout, card or whatever suits their fancy. It is always intriguing to me to see how each person has a unique take on these types of challenges. No two people come up with the same creation. 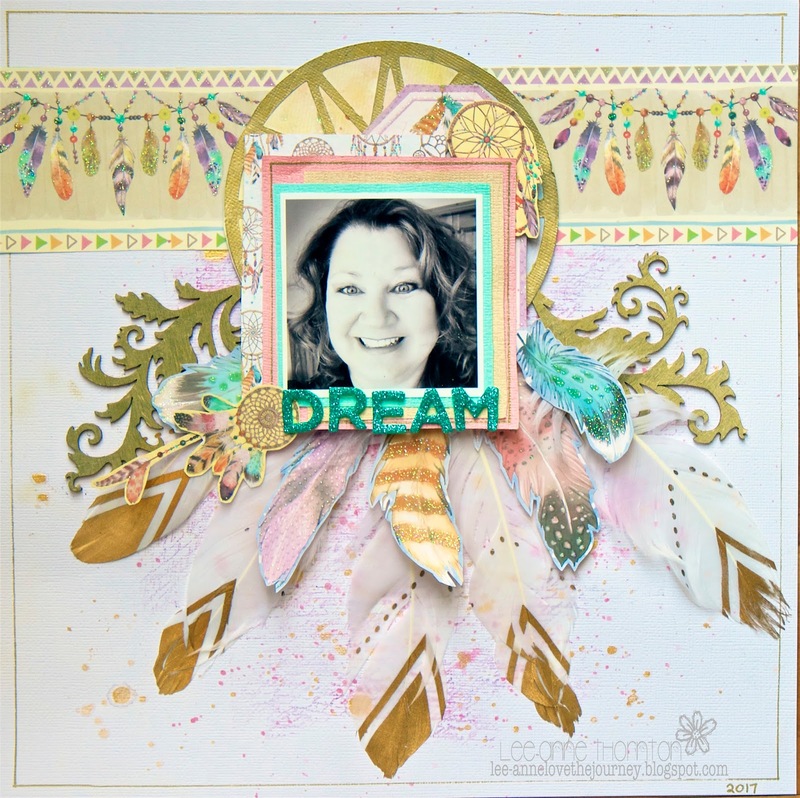 I was immediately drawn to the gorgeous papers in the kit and knew that I wanted to create a dreamcatcher. I began my page by taking a 12 X 12 piece of white textured card stock. The purple ink that I used is by the Multicraft Forever In Time Collection. I "stamped" the ink pad onto my craft mat and used a water brush to add some water and mixed the ink and water together and using the packaging technique, I stamped the paper. I wanted a little more texture so I added a script background stamp, that was in my stash, and pressed the Multicraft purple ink pad onto it and stamped around my page until I was happy with the look. I felt that it still needed something so I added some splatters of Heidi Swapp Color shine in Gold Lame. Once it was all dry, I took the fabulous Multicraft gold pen and colored the Multicraft chipboard flourishes with gold and let them dry. Now it was time to assemble my page. 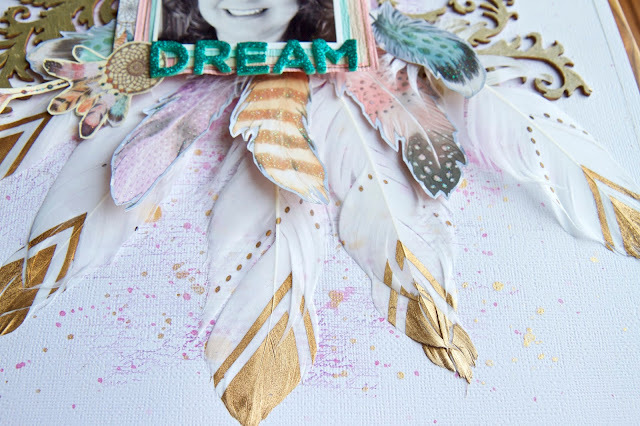 The white feathers with the gold dipped tips are so gorgeous that Multicraft has and I knew that they would be perfect for assembling my dreamcatcher. 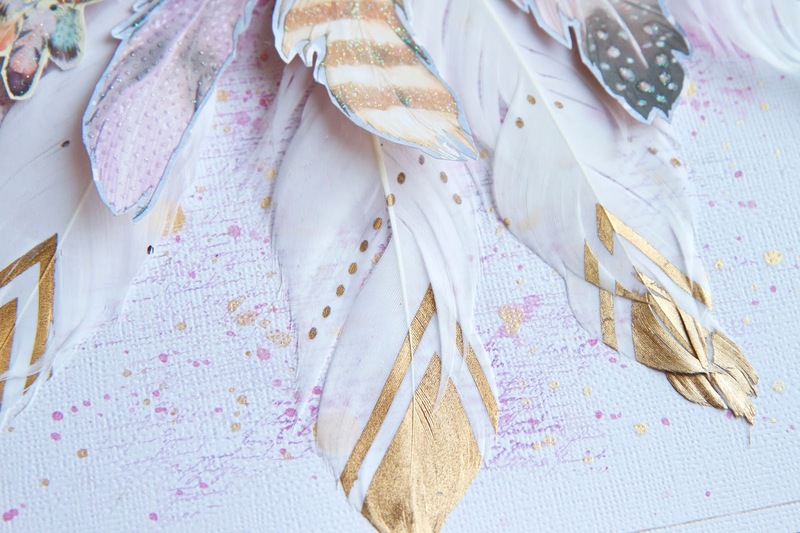 I fussy cut some feathers from the beautiful papers and arranged then on top of the white with gold dipped feathers and adhered them to the card stock. I added a patterned paper strip near the top of my page. The die cut circle above the feathers is a cut file from Just Nick that I cut out on white card stock with my Silhouette Cameo electronic cutting machine and colored it with the gold Multicraft pen. 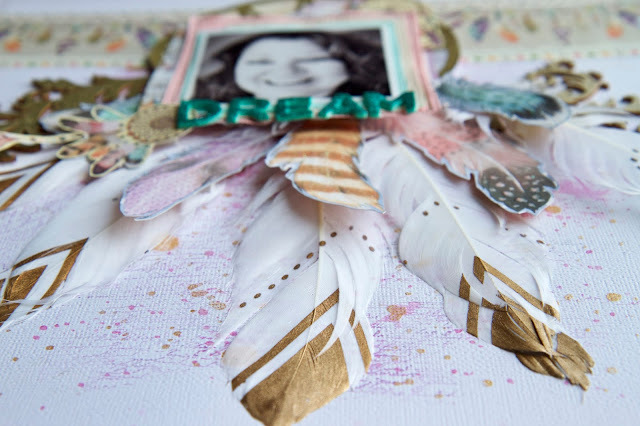 Once it was dry, I backed it with some patterned paper from the Multicraft patterned papers and adhered it to the chipboard flourishes and feathers. My photo was matted onto some of the pretty Multicraft handmade pastel papers and added a tag and scraps of patterned paper behind the photo to give it more layers. 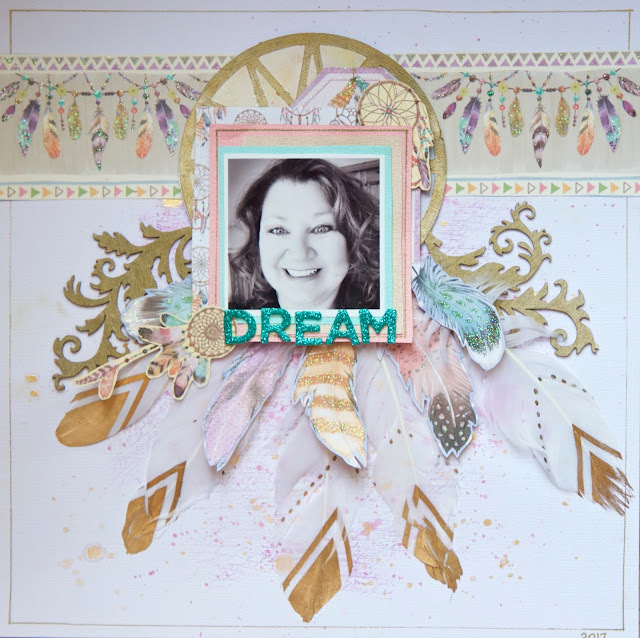 I added a gold line near the outside edge of my white cardstock background with the gold pen and a ruler and also the pink paper that mats my photo. Finally, I hand journaled the date on the bottom right hand corner of the white card stock background. 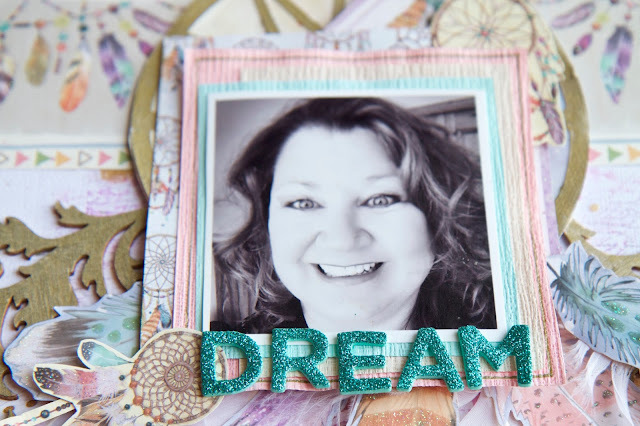 My title was created with some pretty sparkly aqua American Craft alphabet "Thickers" from my stash. I hope you enjoyed my tutorial and layout and are inspired. Have a wonderful day and happy creating!